The 2019 American Youth Circus Festival will be held in San Diego, CA on August 14-18th, 2019. We are looking to fill a variety of positions at various levels of leadership for the event. The event is managed by AYCO’s staff in collaboration with our host, the San Diego Circus Center. The application for our Work Study volunteer program for young adults ages 18-26, and the workshop leader application are separate and will be available shortly. Contact natasha@americanyouthcircus.org with any questions. Read on for descriptions of each role. All individuals holding stipend positions are expected to attend the event and arrive in San Diego by 12pm on 8/14 and stay through 3pm on 8/18 with any exceptions noted below. Staff are expected to prioritize their position, and will not be able to attend more than 1-2 workshops a day. This event is a labor of love. Being a part of the festival team requires the capacity to be high energy, a quick problem solver, and a keen collaborator. You will be working and playing hard! Because this event is so full on, the best candidates for these positions are able to accurately self-assess their capacity and needs. We are looking for people who will find a balance by advocating for their own basic needs as to not burn out. The Program Director is responsible for successful planning and execution of the workshops that take place at the festival. They do all outreach, vetting, curating, and scheduling related to the 2019 festival workshop schedule in consultation with the Festival Director. Their work involves managing application forms, communication with all applicants, managing equipment distribution, and deciding what workshops are offered when and where during the event. The ideal candidate is highly organized, a great problem solver, has knowledge of circus safety and equipment, and has an understanding of the who’s who in circus education in the US. The Program Director will manage and work with the Site Assistants, as well as many work study volunteers. The Program Director will work with the AYCO Festival Director to ensure that their portion of the event is executed to completion and attendee satisfaction. They are expected to be in communication with the Festival Director, with an anticipated 40-50 hours work/phone calls at a distance before the event to prepare for on site work. On site, the Program Director is in a leadership role and is responsible for the execution of their task. They will be expected to be on site from 8am through the end of day. They will be responsible for ensuring that their task is completed, liaising with coordinators, delegating to assistants and volunteers, and fielding questions from attendees. 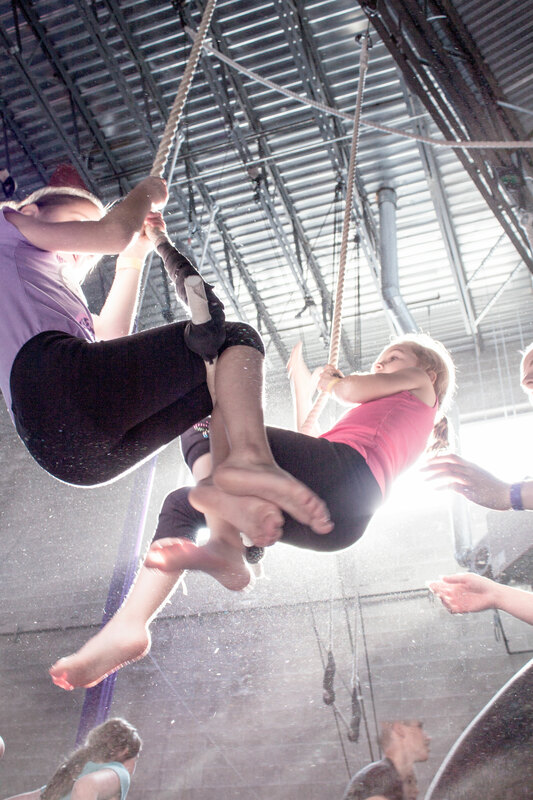 The Program Director should have experience working with others and managing projects as well as strong connections and networks in the US circus education sector. The Festival Assistant will work directly with the Festival Director in the weeks leading up to the Festival and during the event. They will be responsible for a variety of tasks, including leading the work-study team and assisting the Catering Coordinator when necessary. They will aid the 20-30 person work-study team in understanding where to be when, and are responsible for creating a positive and inspiring environment for the young adults who volunteer for us. The Assistant Festival Director will help to create a schedule for each volunteer, and will be required to make decisions on the spot and problem solve when unexpected volunteer needs arise. Experience as a work study participant in the past is very helpful for this position. They will have an anticipated 20-30 hours work/phone calls to prepare for on site work. On site, the Assistant Festival Director is in a leadership role and responsible for the execution of their task. They will be expected to be on site from 8am through the end of day. They will be responsible for ensuring that their task is completed, delegating to assistants and volunteers, and fielding questions from attendees. They will be able to take workshops/participate in festival activities based on the timing of their work, but their work must be the priority. The Assistant Festival Director should have experience working with others and managing projects as well as a vested interest in expanding their influence in the US circus education sector. The Catering Coordinator is responsible for ensuring that all food arrives on site and is ready for participants at the appropriate times. The job will entail confirming logistics with caterers on a day-by-day basis, and making sure that all meals run smoothly. The Catering Coordinator will report to the Festival Assistant and Festival Director. They will be responsible for ensuring that breakfast, lunch, and dinner are ready for participants each day as well as other related tasks such as keeping coffee brewing for the adults, and making trips to Costco for snacks. The coordinator will work with a team of work study volunteers who will help with serving and setting up the food. The Festival Director will choose and order all of the food and then hand over all relationships to the catering coordinator to finalize and arrange pick up, etc. Local knowledge of San Diego and having/driving a car will help applicants to this position. This position is great for a local parent and may be offered in trade for festival passes when appropriate. The Catering Coordinator work with the Festival Director to ensure that their portion of the event is executed to completion and attendee satisfaction. They will have an anticipated 20-30 hours work/phone calls to prepare for on site work. On site, the Catering Coordinator is in a leadership role and responsible for the execution of their task. They will be expected to be on site from 8am through the end of day. They will be responsible for ensuring that their task is completed, delegating to assistants and volunteers, and fielding questions from attendees. The Catering Coordinator will be able to take workshops/participate in festival activities based on the timing of their work. The Catering Coordinator should have experience working with others and managing projects as well as a vested interest in expanding their influence in the US circus education sector. The Registration Coordinator work with the Festival Director to ensure that their portion of the event is executed to completion and attendee satisfaction. They will have an anticipated 20-30 hours work/phone calls to prepare for on site work. On site, the Registration Coordinator is in a leadership role and responsible for the execution of their task. They will be expected to be on site from 8am through the end of day. They will be responsible for ensuring that their task is completed, delegating to assistants and volunteers, and fielding questions from attendees. The Registration Coordinator will be able to take workshops/participate in festival activities based on the timing of their work. The Registration Coordinator should have experience working with others and managing projects as well as a vested interest in expanding their influence in the US circus education sector. The Site Assistants will be responsible for helping with a wide range of tasks throughout the Festival, including aiding the Program Director, managing the merchandise table and assisting with catering and registration. They will work with the work-study team, and will act as floaters between the other staff throughout the day. Site Assistants work with coordinators and directors to make sure that the event runs smoothly. They are expected to be in touch with the Festival Director periodically prior to the event, with an anticipated 5-10 hours of work/phone calls to prepare for on site work. On site, assistants are expected to be attentive to their role and tasks during the entire event –they will be expected to be on site from 8am through the end of day. They will be responsible for liaising with volunteers, delegating tasks, and problem solving. Assistants will be able to take at least one workshop per day, which will arranged in advance with the Festival Director. Participation in other aspects of the event are contingent on what role they are playing each day. Assistants should enjoy working as a part of a team, have the confidence to work autonomously on projects, communicate well, and be able to the ability to self-assess their own strengths and weaknesses. Assistant positions are best suited for individuals looking to develop skills and networks in the US circus sector.